People think telling politicians their ideas is how to make things happen, but that’s just a test of how well a politician can fake empathy. If you really want your idea to happen, you need to go through a city funding process. The Neighborhood Park and Street Fund submission deadline is 2/8. The fund provides for small-scale improvements to streets and parks, up to $90,000. Last year we held a vote on Wallyhood and the winning project got funded. Projects are chosen by the Lake Union District Council, then implemented by parks or SDOT. If nobody submits ideas for Wallingford, then we get nothing, so if you have a good idea please suggest it in the comments. You can use responses from your neighbors as demonstrations of outreach and community support in your application! Beyond that, there’s matching funds. Matching funds allow groups like PTA’s to receive cash from the city in exchange for sweat equity when doing things like upgrading playground equipment. There’s 3 funding levels- up to $1,000 (no deadline), up to $25,000 (2/1 deadline), and up to $100,000 (5/2 deadline). Past projects include building and then upgrading Meridian Playground (100K and then 25K), upgrading McDonald Playground, and (currently) upgrading the JSIS playground. For more info on the matching funds, click here. 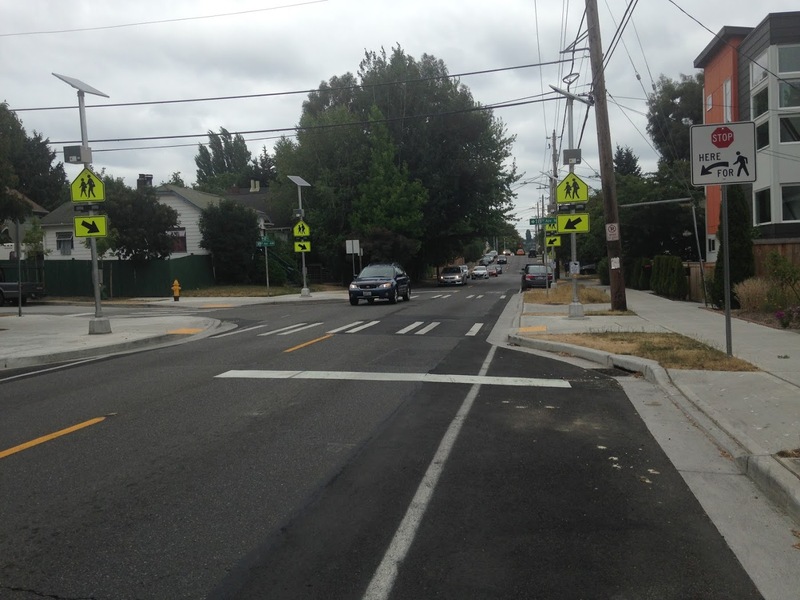 Hi, I had contacted the city last fall about the possibility of installing Rectangular Rapid Flashing Beacons (RRFBs) at the crosswalk on Greenlake Way and N 52nd St. It’s a well used crosswalk to get to the play fields and I often see kids and families having difficulty crossing there due to the heavy traffic on Greenlake Way. When I contacted the city they suggested I apply for the neighborhood funds for the project, but I had forgotten about it until I saw this post….I’d love to submit the proposal if folks think its a worthwhile project. That would be great Sonja! They’ve been installed all along Stone Way up to Green Lake Way because of accidents, and Green Lake Way on that stretch is really a continuation of Stone Way. I’ve seen conflicts between pedestrians and vehicles that don’t see the crosswalk. The crosswalk is used a lot and also has a lot of car traffic, RRFBs would be a great safety upgrade. I think there is only (1) RRFB on Stone way? We could use more. Every crosswalk between 50th and 34th is dangerous in my opinion. I think adding beacons to 52nd St/Green Lake Way crosswalk is a good idea. I use that crossing a lot :). The one with the pedestrian light between 54th and 55th could actually use more visibility too (like flashing lights? ); since some drivers seem to completely miss it (I have had several drivers run the light right in front of us). My concern would be that if 52nd St has a flashing beacon and 54th/55th St does not that even more people will run the traffic light at the latter. Redrawing some of the lines on the road, like where to stop at a safe distance and the cross walks themselves, would help too since these lines are all faded due to heavy road use. I just requested an investigation to pedestrian safety concerns crossing Stone Way at 40th. I have been very close to getting hit while crossing this street with the walk signal, which is a very short window. Visibility is likely an issue, but more importantly, is the level of activity at this intersection with cars turning onto Stone Way coming from both directions on 40th as pedestrians are also trying to cross safely. Despite the area being fairly well lit and a traffic light present, there are far too many close calls. I have recommended a new light that prohibits drivers from turning onto Stone Way while pedestrians have the walk light, as well as prohibiting the free right turn. I know we all love those, but as a pedestrian, I am keeping my eye on them as well as the drivers coming off of 40th with the light and it’s beyond scary at times. I would estimate nearly 70% of the time the drivers don’t even see or acknowledge that I am there. Agreed, I’ve almost been hit by drivers careening around the corner taking both a “free” right turn, and just turning on green. I think we need more than pedestrian improvements; we need SPD to come out and do their jobs, including speed enforcement and crosswalk stings on 40th and Bridge Way. Obviously, we need a structural overhaul to eliminate the load-bearing post at Starbucks, thus clarifying which way the line should go. That and skatepark enhancements to ensure sufficient facilities for all to skate transition. Another idea would be to install curb cuts in Wallingford – particularly between 45 and 40th/Wallingford and JSIS – so that those with physical disabilities can get around with ease, rather than not at all or with fear. I’d love to see something done with the space under I-5, north of 40th, even if it’s just a lighted, paved path. To me that’s a legitimate walking/biking route from 42nd to the Burke-Gilman Trail, but right now it’s a muddy mess that’s gotten so bad that dirt and rocks have slid down the slope and now cover the sidewalk under I-5. Yes, DOUG, I have also wondered why we couldn’t do something more with that space, especially since 45th is so congested and dangerous to cross. Under the freeway at 42nd/40th and 5th NE/Pasadena might provide some alternative for bikers and walkers to move between Wallingford and the U District/UW, provided it was sufficiently landscaped with paths and lights, etc. I’d like to see a bike box in the left turn lane on Northlake Way, so bikers can transition from the B-G trail onto Westbound 34th St and thus cross the Fremont Bridge. I’d like to see a real traffic light at Sunnyside and 50th, rather than just the pedestrian-triggered light that is there now. I’d like to see the other ideas posted so far implemented as well.